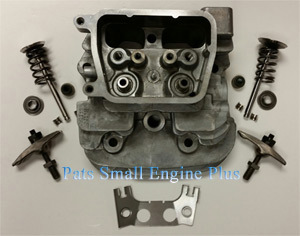 Cylinder Head Complete Kit - These Kits are Made by us (Pats Small Engine Plus) with Genuine Kawasaki Original Equipment Parts. 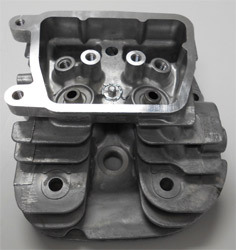 Typical Overhead Kits Include: Cylinder head, valves, springs, spring caps, rocker studs, collets, adjuster nuts, lock screws and guide. Identifying Cylinder 1 or 2 on V-Twin Engines: There is markings that will say CYL-1 or CYL-2 directly on the head on the opposite side of the spark plug. If the markings are missing or to hard to read on vertical engines looking directly at the V (where the carb should be) and the left side would be cylinder #1. On horizontal engines you will need to look at the engine from the PTO side (opposite the flywheel side) the #1 cylinder would be on the left side. FOR KAWASAKI ORIGINAL EQUIPMENT PARTS WITH PARTS LOOKUP DIAGRAMS, PLEASE READ BELOW BEFORE CLICKING ON THE DIAGRAM. The parts lookup website is original equipment parts only. 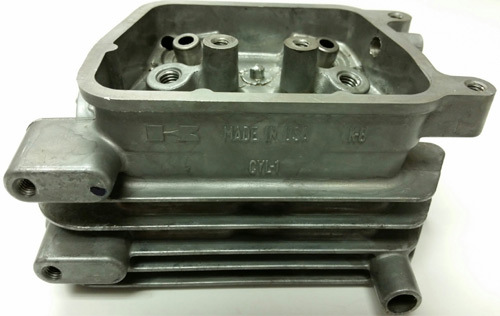 This website has aftermarket and OEM mix on the most common parts. Please note that when you go to the new website if any items are in your cart they will not transfer over. All though they will be saved for 24 hours. When you are looking to place your order and have items currently in this website's shopping cart and want to add OEM parts from the other website, please phone your order in, please see our ordering department page for the proper phone number and hours of operation.